What is your background in self-defense training? I’ve trained for 25 years at Seattle’s Feminist Karate Union, which back in the early 1970s was one of the pioneering self-defense organizations for women. I am nationally certified to teach Empowerment Self-Defense by the National Women’s Martial Arts Federation. When did you start teaching at Bellevue College CE? Why? I began teaching at Bellevue College (then Bellevue Community College) in 2007. I really don’t remember why, I suspect that someone contacted me since I was already teaching at the UW Women’s Center and at the ASUW Experimental College. I primarily teach Self-Defense 101 for Women, a six-week progressive skill-building course. In the summer I teach single-afternoon classes for teen girls, teens, and girls off to college. Who is a good candidate for taking your classes? A good candidate for taking these classes is any female who wants additional skills so they feel more comfortable assessing risk, navigating their daily lives, and dealing with potentially threatening situations with more confidence and success. What are the top three takeaways a student will walk away with? Why is self-defense training important? Because life happens. Because, every so often, even though most people are fairly nice and reasonable, there are those who mean harm and seek out targets. Because being able to recognize when someone is pushing boundaries is essential for a happy life, and being able to assert one’s boundaries is essential for a healthy life. How do your teen classes differ from the adult ones? Teen classes are a single 3 hour session, and often fit better into teen summer schedules. Obviously they cover less material, and are focused more on skills for younger, less experienced girls to be able to recognize those risks they are more likely to encounter as they gain more independence. Teen girls are also welcome to attend the six-week course; younger teens would benefit from having a mom also attend. We’ve had 15 and 16 year old girls successfully take this class without adult accompaniment. What advice would you give someone who is thinking about taking a self-defense class? 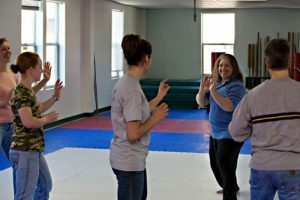 A good self-defense class teaches skills in awareness, assertiveness, verbal confrontation skills, safety strategies, and physical techniques. These strategies can help you prevent, escape, resist and survive assault, abuse or harassment. A good self-defense course provides training in psychological awareness and verbal skills, not just physical strikes. Knows the facts about abuse and assault aimed at women, and tailors their classes to this reality. For example, a good class will address situations involving acquaintances and romantic partners, not just attacks by strangers. Knows the realities of women’s lives and is able to work with each student where they are. For example, a good teacher is able to adapt verbal and physical techniques to each student’s strengths and challenges; they will not have a “one-size-fits-all” program. Respects women’s decisions on how to handle dangerous or threatening situations and does not blame or judge survivors. Offers techniques, knowledge and strategies to help students make their own decisions about how to handle situations. They do not tell students what they should or should not do. Takes an emPOWERing approach not only to the practice of self-defense but also to teaching the program. For example, students should be able to determine their own levels of participation in the class, and no one should feel pressured into doing specific exercises. I use these five questions to decide if any specific piece of information is emPOWERing or not. Is it based in reality? Is this piece of advice based on work that has been demonstrated to reduce violence and harm? Does it address real threats? Or is it a “thought experiment” (which is most often a marketing tool)? Does it give you tools? Do you come away with strategies and tactics to deal with real threats, or does it simply scare you? A related point: does that information encourage you to make someone else’s life smaller, based on their race/gender/ethnicity/sexual orientation/etc. to keep you “safer?” If the answer is yes, it is neither useful nor empowering. Is it victim-blaming? Empowerment Self-Defense gives you tools to keep yourself safer, while simultaneously placing responsibility for any assault squarely where it belongs – with the perpetrator. Nobody asks to be attacked. Ever. Does it prioritize self-determination? Or are you placed on a box, a virtual prison that you’re persuaded to enter? Do you get to make your own safety choices? Interested in signing up for one of Joanne’s classes? Here’s what’s coming up: Self-Defense for Teen Girls – Ages 15-17 on 7/24; Self-Defense for Teens on 7/31; Self-Defense for Teen Girls Off to College on 7/17 & 8/7. Sign up today to secure your spot in the class!